With one of the best betting days on the sporting calendar just around the corner, the NFL Super Bowl, it's time to take a look at some of the hot betting promotions on offer for the big game! All of the top betting agencies have stacked their promotions pages with great offers for the Super Bowl, and we outline the best of them below! Place a Match bet on Super Bowl LIII & if your team win, Sportsbet will DOUBLE YOUR WINNINGS, up to $50 in bonus bets! Request a market on Super Bowl LIII between the Patriots & the Rams at Sportsbet & they'll price up the your suggestion! 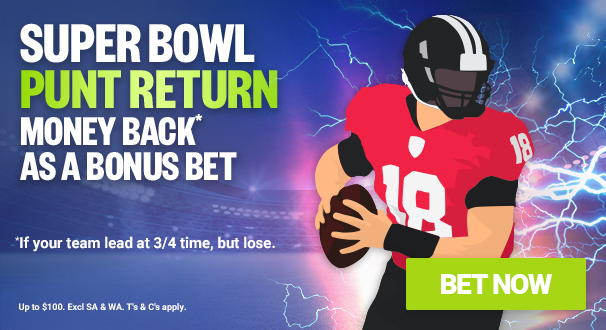 Place a 3+ leg SAME GAME MULTI on Super Bowl LIII & if 1 leg fails, get up to $50 BACK in bonus bets at Sportsbet! Bill Belichick and Tom Brady are looking to make it 6 Super Bowl victories for the Patriots and Ladbrokes are offering $2.50 for the Patriots to lift the Vince Lombardi Trophy once again! Place a Head to Head bet on Super Bowl LIII and if the team you back win, BetEasy will double your winnings in cash up to the first $25 of your stake. Rams and Patriots will play off in this year's Super Bowl LIII. Get your stake back in Bonus Bets if your team scores the First Touchdown but loses the Super Bowl at Neds. Back a team in SBLIII at PalmerBet and if your team loses the match but leads at the end of 3/4 time, you'll receive a bonus bet matching the value of your first wager up to $100. 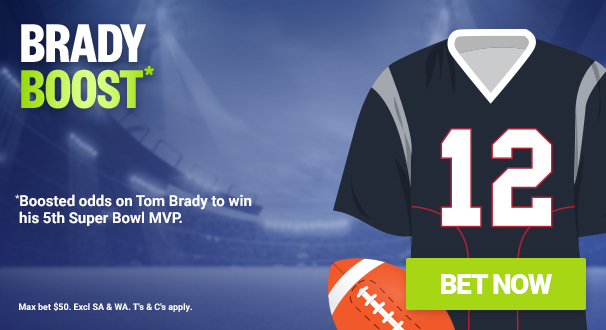 Get increased odds of $2.50 for Tom Brady to win the MVP in Super Bowl LIII at PalmerBet!